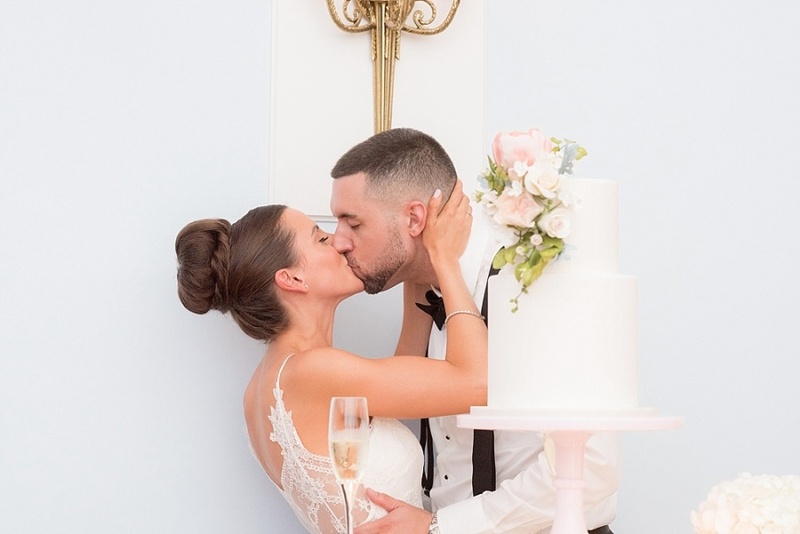 When original plans to marry in Aruba shifted, this Bride-to-be jumped headfirst into planning her revised wedding in NYC (and as the face behind Michelle Elaine Weddings, she didn’t even miss a beat). The finished results are pure perfection; from the subtle nods to her fur babies to a dress that leaves us breathless (found at the fabulous Kleinfelds). Mikkel Paige and NST Pictures captured it all – get a look at it all via our Vault before it airs on “Say Yes to the Dress” tomorrow! Our story began over 15 years ago in high school. We weren’t high school sweethearts, as many people think, we had more of an on-again/off again type of relationship. But no matter where we went, we were always brought back to one another in some way. In 2013 we had finally went on our last first date, and the rest, as they say, was history. As a wedding planner in New York City I was looking for something a bit different so that this wedding would feel less like work. We began our plans for a wedding in Aruba in mid 2015 in hopes to be wed by the end of 2016. Our plans came to a crashing halt when our Yorkie, Sprinkles, became very sick. My dogs are like my babies, so while everyone thought we were absolutely insane to re-work our entire wedding around a dog, I don’t regret any of it for one single second. With the condition she was in, it would’ve been impossible to do any traveling to plan. So I immediately began to reach out to my contacts here to get a new date on the calendar and host the wedding in NYC instead. We chose a Thursday because it was already deep into March and I knew we’d never be able to get married in 2016 on a Saturday in the summer months. My wedding dress had already been purchased, and yes, when I bought it the intention was for an Aruba wedding. If we were switching to NYC it had to be a warmer time of the year. Being swamped with weddings myself we chose the best date possible and that was it; August 25th was the date and we went full steam ahead planning! Very sadly Sprinkles didn’t make it through much longer but we made sure to incorporate her into as many parts of our wedding day as possible. My seamstress even sewed a piece of Sprinkles’ pink jumper into my wedding dress where it laid over my heart. Some time into our planning I was walking past a pet shop and decided just to walk in; we are huge on rescuing but something drew me in that day. As soon as I walked in I saw the sweetest chocolate colored chihuahua and knew I had to take him home. Chocolate Chip is what we named him – in honor of Sprinkles – see the trend of dessert toppings  Not only was he a wonderful addition to our family but we got the honor of having him as our ring bearer, although he had to be carried since he was so scared! With design and details, I had always wanted blush, grey, and ivory. I feel these colors are elegant and classic. I chose pieces from BHLDN and some from Etsy that not only reflected us personally but pieces that I could look back and still be in love with years from now. From the character and charm of the Marlton Hotel to the simplicity of our decor at the India House, I wanted things to be effortless and timeless. We chose the India House because it had that feel of an old townhouse in Manhattan. I wanted guests to feel as if they were coming to our home for this beautiful celebration. We opted for a cocktail style reception to simplify things. I was already making myself crazy over details and needed to cut back somewhere! When I got to peek at our reception room before guests entered I was overwhelmed with emotion. I walked into my wedding that I’d worked so hard on and I couldn’t believe how quickly it all came together. Soon after it was time to get married! I thought I’d might’ve used up all of my tears during our first look but the rush of happy tears re-flooded as soon as I started to walk down the aisle. Seeing John’s face light up and walking towards him knowing that I’d be leaving the room as his wife was one of the most magical moments that I will cherish in my memories forever. I felt so lucky to be there surrounded by family and friends to finally marry my prince. A very fun and exciting piece of our wedding journey is that when I did go wedding dress shopping at Kleinfeld, I got to shop with Randy! That was an absolute dream come true. I filmed the entire experience for Say Yes To The Dress during Season 14. Down the line, they asked to film our wedding day, and of course, I said yes  It was certainly an added piece of pressure but the experience was once in a lifetime that John and I will never forget!